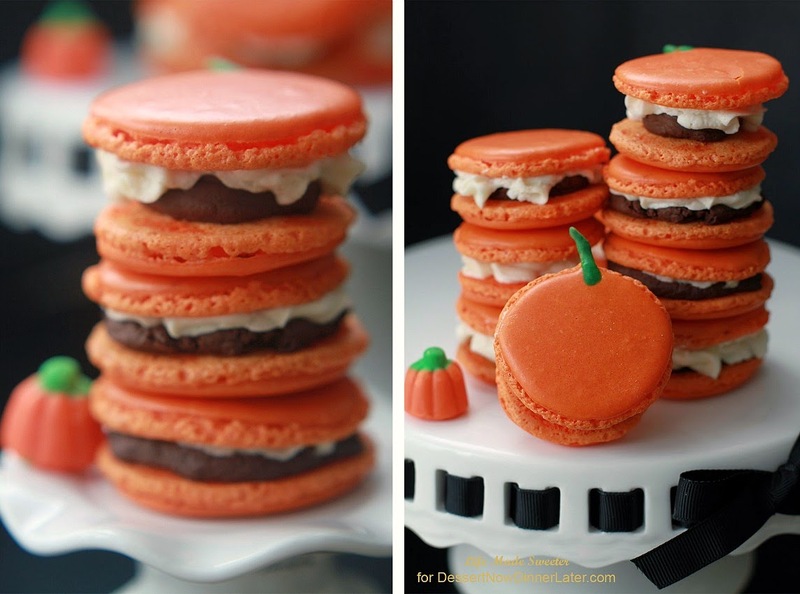 These festive pumpkin spice macarons are packed with fall flavors and make a fun and festive treat perfect for any Thanksgiving or Halloween party! It’s always so much fun stopping by the Halloween section at all of the stores this time of year. My lil guy gets a hoot whenever any of the displays play a spooky sound if a person walks by or when you press one of their buttons. It reminds me how much fun all of these holidays are for the kiddies. Especially with all the colorful and cute treats they have these days. 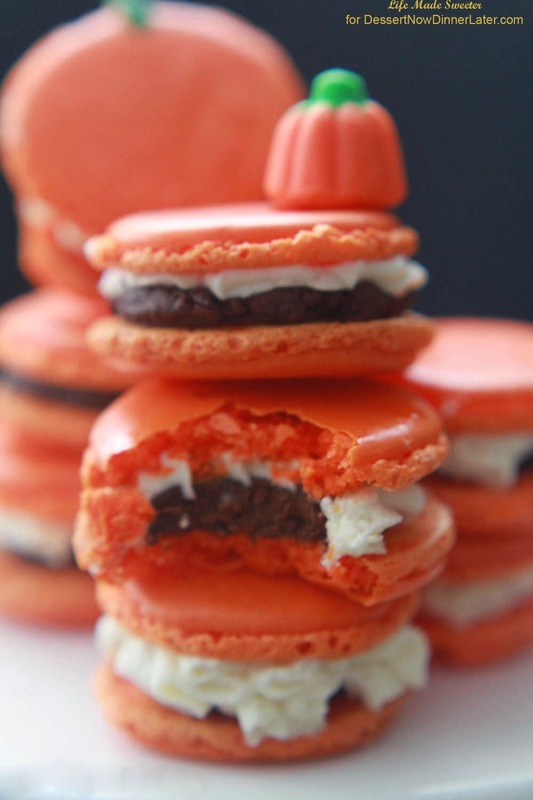 These pumpkin macarons would be a hit for the kids and adults. They are fun and sophisticated at the same time which makes them perfect for a Thanksgiving or Halloween party for all ages. Not only do they resemble little mini pumpkins — the cookie shells are also bursting with pumpkin pie spices. For an extra special surprise, there are also two different types of fillings in these macarons. A generous dollop of pumpkin spice dark chocolate ganache and a layer of pumpkin buttercream frosting. It’s triple the pumpkin in every bite! 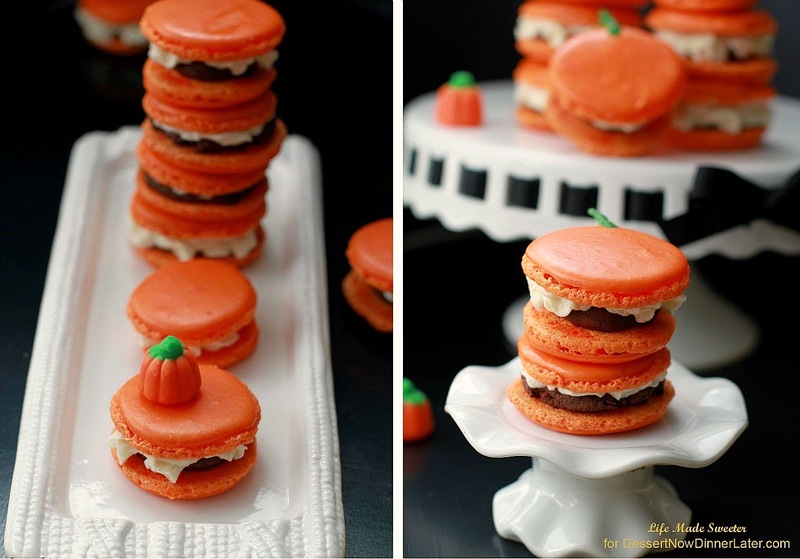 These festive pumpkin spice macarons are packed with fall flavors and make a fun and festive treat for any Thanksgiving or Halloween party! Up to 5 days before making macarons, separate the egg whites, cover and store in the refrigerator. The morning of making macarons, set them out on the counter to come to room temperature. Sift almond flour into a large bowl. Sift the powdered sugar, salt and pumpkin spice into the same bowl. Set aside. With a stand mixer or hand mixer using the whisk attachment - whisk egg whites at medium speed until the egg whites begin to foam. Slowly sprinkle in superfine sugar. Slowly increase speed to medium-high and beat until a firm meringue forms with stiff glossy peaks. Scoop out 1/2 cup of batter into a small mixing bowl. Pour 1 drop of green food coloring or until you reach the color you are trying to achieve. Using a rubber spatula, gently fold in 2 tablespoons of the almond flour mixture into the egg whites until just combined and no more almond flour residue is present. Transfer green batter to a ziplock bag and cut a tiny hole in the corner for piping. Set aside. Add 2 drops of orange food coloring or until you reach the color you are trying to achieve into the rest of the batter in the stand mixer. Using a rubber spatula, gently fold the remaining almond flour mixture into the egg whites. Only fold the batter in one direction by sliding the spatula into the center of the batter, then lifting it up and letting the batter fall back onto itself. It generally takes about 40 to 45 strokes to work the batter, but this number isn’t as important as how the batter looks. The batter is ready to pipe when it has a smooth, shiny surface and flows like lava in one large ribbon off the spatula. An easy way to tell if the batter is done, use a rubber spatula to lift and drop the batter onto itself - if the ribbon gradually disappears into the batter within 30 seconds, it is ready. If not, keep folding a bit longer. Transfer mixture to a pastry bag with a plain round tip. (I used the No. 12 Wilton tip). Pipe rounds onto prepared baking sheets following the templates if using them, leaving space between the macarons to allow batter to spread. 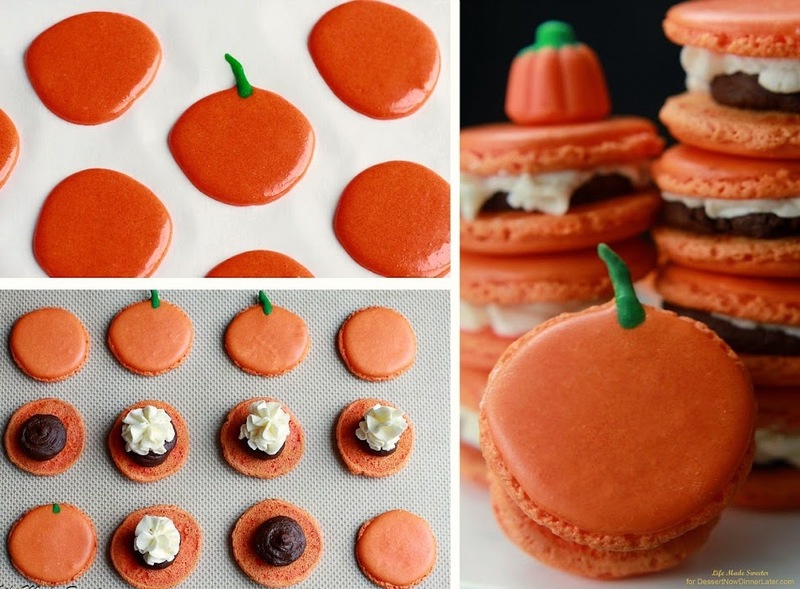 If you want to pipe macarons into a pumpkin shape, pipe wide ovals. Pipe green stem onto the orange macaron shells. Let macarons sit out on counter for about an hour, depending on humidity levels. The macarons are ready to bake when tops are no longer sticky to touch. Gently slide or remove paper templates from underneath before baking. While you are waiting, preheat oven to 300 degrees Fahrenheit. When macarons are dry to the touch, lower the oven temperature to 295 F and bake *both trays at same time (*if your oven has room, otherwise bake one at a time) for 12 to 14 minutes, rotating trays once. Let macarons cool completely on parchment paper before removing. Place chopped chocolate and pumpkin pie spice into a heat-proof bowl. Bring cream to a boil in a saucepan and pour over the chocolate and pumpkin spice mix. Let it sit for a minute. Stir until you have the mixture is well combined. Allow to cool and thicken before filling macarons. In the bowl of an electric stand mixer or with your hand mixer, cream butter on medium high speed for about 3 to 4 minutes. Add powdered sugar, pumpkin puree, pumpkin pie spice and salt. Mix until combined, scraping down the sides as needed. Add heavy cream as needed until desired consistency reached. Increase speed to medium, and beat until smooth and well combined for another 2 minutes. Scrape down the sides and bottom of the bowl as needed. Match same-sized macaron shells. Spoon or pipe a small teaspoon of ganache onto each of the upside-down cookies. Spoon or pipe a half teaspoon of buttercream frosting over ganache. Sandwich the filling with another macaron shell. Repeat for all other macarons.